The White House wants to slash Labor Department funding by nearly 21 percent, a proposal that offers the first insight into how President Donald Trump may operate the agency designed to advance workers’ welfare. The fiscal year 2018 budget blueprint calls for $9.6 billion in discretionary spending at the DOL, down from $12.2 billion for the prior year, according to a proposal released by the White House March 16. The request, known as a “skinny budget” because it is slim on details about specific subagencies, is an indication that the White House may be waiting for advice from a confirmed labor secretary. To absorb the steep cuts, the administration wants to reduce jobless benefits costs, eliminate the Bureau of International Labor Affairs’ grant funding and close at least some Job Corps centers. The White House also said it would scrap certain “ineffective, duplicative, and peripheral” DOL job-training grants. “President Trump’s proposed budget ensures the Department of Labor focuses its resources on protecting workers and advancing opportunity,” Jillian Rogers, a DOL spokeswoman, said in a statement March 16. The budget request is the opening bid in the government funding process for FY 2018, which starts Oct. 1. It is intended to advise Congress on how the White House would like to see funds allocated and offers a glimpse into the Trump administration’s priorities for the coming year. The proposed cuts at the DOL and other agencies are intended to offset the White House’s attempt to increase defense and security spending by $54 billion. The DOL would face the fifth-largest percentage decrease among major agencies. Overall, Trump requested $1.065 trillion in total discretionary spending, with $603 billion going to defense. The president didn’t include proposals on the National Labor Relations Board or Equal Employment Opportunity Commission. The Trump administration is expected to release a full budget proposal in May. Government agencies are currently funded by a continuing resolution that’s expected to be extended before it expires April 28. The proposal to decrease labor appropriations is being framed by Democratic critics as a contradiction to the president’s vows to create jobs and lift wages. “Budgets reflect priorities. 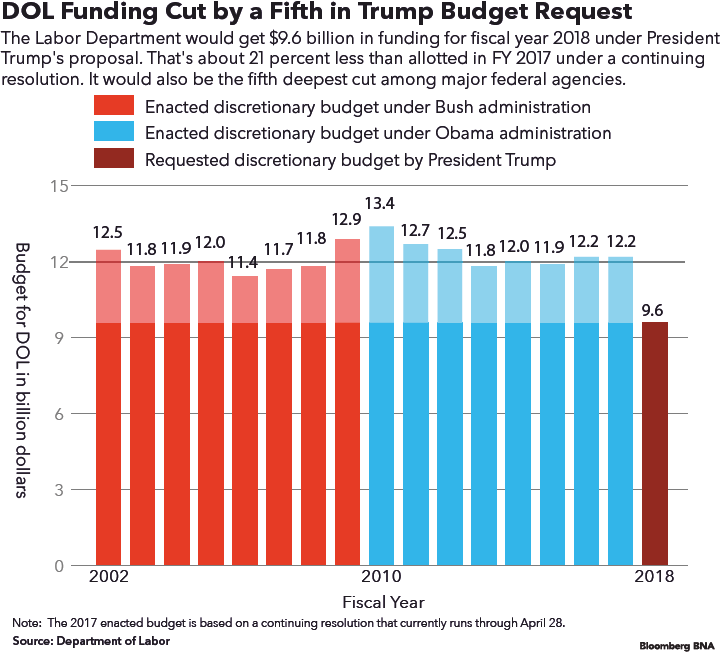 And while Trump’s budget stands little chance of being enacted, it’s amazing how much his proposal betrays the working-class Americans that he promised to help,” Chris Lu, President Barack Obama’s deputy labor secretary, told Bloomberg BNA March 17. The White House’s plan to restore jobs comes largely from tax cuts and regulation rollbacks designed to ease pathways for businesses to hire within the U.S.
Trump’s supporters won’t share the perception that spending cuts are inconsistent with the president’s promises to workers, Diana Furchtgott-Roth, who served on Trump’s DOL transition team, told Bloomberg BNA. Furchtgott-Roth was the DOL’s chief economist from 2003 to 2005, and she recalled the political challenges of convincing lawmakers from both parties to reduce funding. About three-quarters of the DOL’s annual spending in FY 2017 was devoted to the Employment and Training Administration, which administers state unemployment benefits and oversees thousands of state and local workforce training programs. Without specifying how much it would trim from the ETA budget, the White House did outline several forms of cutbacks in training grants and jobless benefits costs. For instance, it said it would seek to reduce improper jobless benefits payments through an expansion of re-employment and eligibility assessments. The budget would also trim $434 million by eliminating the ETA’s Senior Community Service Employment Program, which provides job training for older unemployed workers. The White House did commit to helping states expand apprenticeship programs but did so without offering a dollar figure. The DOL enforcement agencies, such as the Wage and Hour Division and Occupational Safety and Health Administration, are also likely to face decreases. The labor secretary nominee, Alexander Acosta, is sure to face questions about the budget cuts when he goes before a Senate panel March 22 for a confirmation hearing. The White House coordinated with Cabinet members of other agencies before releasing its blueprint, but the DOL section was written without a confirmed political leader. Acosta wasn’t briefed on the budget proposal prior to its release, his spokeswoman told Bloomberg BNA March 16 via email. Members of the Senate Health, Education, Labor and Pensions Committee are still likely to ask Acosta whether he agrees with the president on the funding request and which programs he thinks should be cut. Congressional appropriators will now get to work on their own DOL budget proposal, to be included in an appropriations bill shared by the departments of Education and Health and Human Services. Rep. Virginia Foxx (R-N.C.), chairwoman of the House Education and the Workforce Committee, was noncommittal in her response to the Trump administration proposal. “We’re going to live with any allocation that we’re given, but people need to understand there will be consequences that will be very dramatic—and just don’t be surprised if all of a sudden members’ phones start ringing off the wall if indeed we try to start shutting down Job Corps centers” and other services, Cole said. The budget proposal is available at http://src.bna.com/m1z.